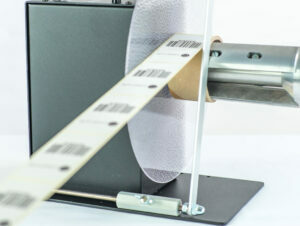 The CAT-4-ACH handles labels up to 155 mm wide and will wind a roll of labels up to a 280 mm diameter. This unit includes an Ajustable Core Holder (ACH) that accepts any core size from 25mm to 101mm. An external commande interface on the CAT-4 allows to support direct control start/stop by the barcode printer (check compatibility with your printer vendor). The CAT-4 offers also an optional adjustable Start Delay to allow the printer to execute back-feed withtout resistance from the rewinder. Rugged, heavy-gauge steel construction allows your CAT-4 Rewinder to be simply set in place. Special anti-slip feet keep the unit from moving. Reliable, high quality and maintenance-free, the Heavy-Duty CAT Label Rewinder features a 5-YEAR PARTS and LABOUR LIMITED WARRANTY (1-Year on power supplies), the longest in the industry. Adjustable Paper Guide: guides the outer edge of the labels to ensure an even roll edge.